Sub-prime mortgage concerns have been causing world markets to collapse one after another, but if you're a resident of Second Life, you might find your financial situation just as precarious. 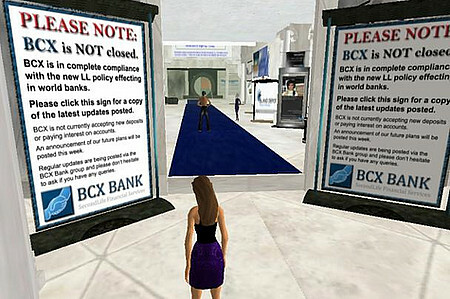 Since the August 2007 "bank run" on the virtual Ginko Financial and other financial improbabilities (like offering 100% interest on bank "deposits"), Linden Labs is banning all forms of banking unless you happen to have "an applicable government registration statement or financial institution charter." Objects such as ATMs, which used to disburse Linden dollars, are now silent so depositors have no way to get their money back. The earlier Ginko Financial incident may have cost Second Life depositors $750,000 (US dollars as opposed to Linden dollars).